There are over 10,000 pupils receiving their education through Irish in Gaeltacht secondary schools and all Irish schools. Transition year students should be able to take advantage of this learning aid which has been provided with funding from the Department of the Environment, Heritage and Local Government, this facility would also benefit Junior Certificate history students and Leaving Certificate students studying art history. Therefore it is necessary that the material be available in Irish, so that students can undertake the work in the schools normal, day to day language. 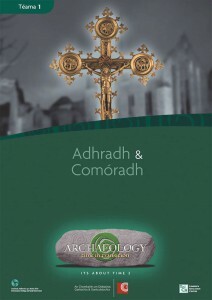 The aim of the teaching aid is to gain appreciation from students for the history and archaeology that are available in the local environment and to develop awareness of cultural heritage which surrounds them. 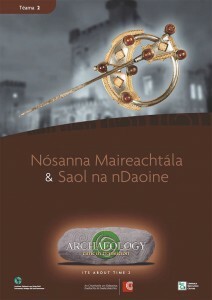 Irish is a central part of the culture and heritage of Ireland and there is a strong relationship between native Irish archaeological conservation and the preservation of the language. Therefor, it is very suitable that all students are given the chance to link the Irish language to this work and that they get to do some of the activities through Irish. This transition year course is a very comprehensive course, however there are no indications given of how many class hours should be spent of this course. There are 25 lessons, 12 of these are based on image content ( there is an option with these that more then one class period be given for teaching), materials on CD, proposals for 10 projects, 75 work sheets (information sheets/fact sheets/work sheets), 13 PowerPoint presentations and 17 additional information packages. Teachers Handbook – recommendations for the projects, record sheets, ranking, glossary, health and safety, guidance on monuments and artifacts. Theme 1 – Worship and Celebration – worship, monasticism, pilgrimages, celebration. Theme 2 – Lifestyle – home, defense, towns, lifestyle. 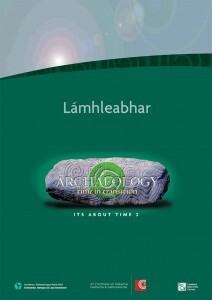 Theme 3 – Archaeology – sources, digging, professions. 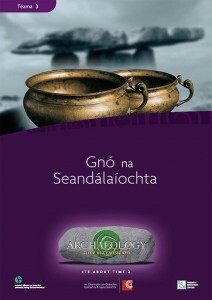 CD with audio materials, PowerPoint presentations, transition year certificate, additional information packages.